College can either be two things: an extension of high school where you were popular, or an extension of high school where you were beat down by bullies on a regular basis. But for better or worse, college does not have to be a stepping stone for you to become a successful professional in the future or an avenue for you to become an entirely antisocial and pessimistic individual. Entering college offers a fresh start for everyone and offers a great way to build new and lasting relationships. You may also see content writer email signatures. College also entails more interaction with professors and instructors, specifically email conversations. That is the reason why email signatures are needed to make the conversations more dignified and formal. If you are a college student yourself, or about to enter college in the near future, you need to have an email signature. 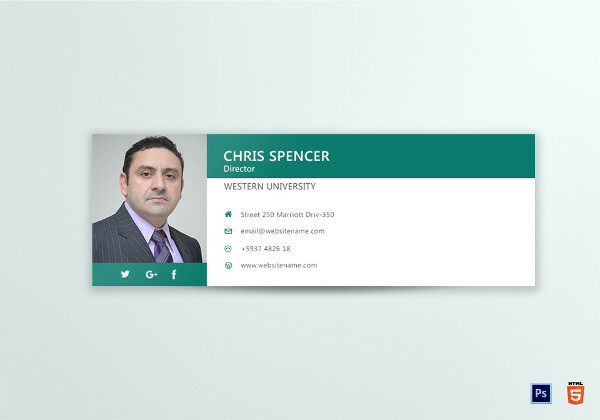 Listed below are some college email signature examples that you can purchase at very affordable prices. You may also see personal email signature examples. Listed below are some essential tips in creating an effective college email signature. Remember, the tips below are not only for college email signatures but all types of business email signatures as well. This is the most important tip when creating a college email signature. Take note that an email signature is still a business document that needs to retain a high level of formality. The text should be readable by using specific font styles (i.e. Times New Roman, Calibri, Arial) and using the right font size (not too large yet not too small, in which every text can fit inside the email signature). You may also see teacher email signature examples. Using graffiti or other casual font styles should be avoided at all costs. The reason for this is you will be the using the email signature when having email conversations not only with your classmates but with your teachers, professors, and instructors as well. You may also be in contact with your college dean or other senior college officers, so make sure the email signature is quite formal. You may also see email signature design. The text that you will be listing in the email signature are as follows: full name, year level, and contact number. There is no need to include the email address in the email signature as it creates redundancy (the email address can already be found in the email thread). To add a little bit of creativity to the email signature that does not compromise the formality, add a motivational or inspirational quote. Insert the quote after the all the previous information have been listed down. You can italicize the quote but if the quote is quite lengthy, make the font size smaller to make the entire quote fit inside the email signature. You may also see music email signatures examples. As previously mentioned, the effectiveness of an email signature is not based on the designs and colors being implemented. That is the reason why designs and colors should be applied to a minimum, and should not take over the entire email signature. The text (specifically the information you provided such as your name, contact number, year level, etc.) must be prioritized over everything else but it does not mean that the email signature will not have any kind of aesthetic. You may also see training email signatures. Since this is a college email signature, you should definitely use college-inspired designs. There are hundreds of designs you can use for this kind of email signature, but among the more popular include school buildings, graduation attires, books, bicycles, and of course, college fashion (depending on what decade you decide to use for your email signature). You may also see wedding planner email signatures. For the color meanwhile, use bright colors as these type of colors are the perfect representation of college students: enthusiastic, energetic, intelligent, and dynamic. Yellow, pink, orange, and lighter shades of blue are your best options for a college email signature. You may also see marketing email signature examples. An email signature is not complete without a photo. But using any photo for an email signature will not suffice. Insert a recent photo, preferably taking a photo within the day when the email signature will be created. It is highly suggested that when taking the photo, your face should be clean and free from blemishes and dirt. Wash your face before the picture will be taken and apply a little bit of makeup. You may opt to wear a very formal business attire for the photo (i.e. suit and tie), but a smart casual attire will do (polo shirt, plaid shirt, or anything that will cover the neck area). You may also see human resources email signatures. The photo that will be inserted should only focus on the face and small part of the shoulders. Inserting a full-body photo in the email signature is not advisable as the email signature is too small, which in turn makes the photo too small. Your email recipient will not be able to see your face if you will be using a full-body (or even half-body) photo. You may also see beauty parlor email signatures. College students tend to link their social media accounts to their online portfolio. There is no problem with it as long as they are not attached to a more formal platform or tool, of which one is an email signature. You may also see corporate email signature designs. Social media is too casual due specifically to the content, and individuals use it mostly on their spare time and as a method to communicate with friends and family. Additionally, individuals occasionally post shallow and insulting things on social media, and it does not match well with the formality of the email signature. You may also see business email signatures. If you want to pursue inserting hyperlinks, insert a link to your college or university instead. This will be more appreciated not only by your college peers but also by your professors and instructors. College does not have to be difficult. Even if you are not the most popular person in school, you can still excel and be more prepared taking on bigger and more meaningful responsibilities. Here are some essential college life hacks that will make college life easier (and more bearable) and will help you graduate in no time. You may also see personal email signatures. Everyone has done this at some point in their lives. Let’s be honest, it’s very difficult to memorize all the notes in the class. It’s like memorizing a whole chapter of a book, or even worse, the whole book for just one exam. Befriending the smart classmate may not be the most ethical thing to do, especially if you are probably just using him or her to pass the subject. But it does not have to end for the two of you becoming complete strangers. The trick here is to befriend the smart classmate by building a long-term relationship. You two may eventually need each other’s help in the future, especially in your respective careers. You may also see corporate email signatures. Also, avoid bullying the smart classmate as he or she is much more intelligent than you are. He will likely be more successful than you can ever be in the future. Don’t talk to him during just exams or reports, but establish a rapport (or in words, friendship) by talking to him outside school premises and inviting him to hobbies you enjoy. You may also see company email signatures. This life hack is similar to the first one, but you will likely have a hard time befriending your professor and instructor as they already know your plans. Instead, get your professor’s attention by being active during class recitations, submitting projects on time, and passing exams and quizzes. If there are school activities if the professor is organizing, be the first to join. You may also see professional email signatures. You may think of this as being a teacher’s pet, but being an actual teacher’s pet is more damaging to a student’s image. It entails to having no social life and being on-call for the teacher 24/7 (including weekends). One of the best ways to gain more friends as well as become a noticeable figure around the campus is to be more active during school activities. As previously mentioned, your professors and instructors will also notice if you will be joining activities, so don’t hesitate to join. There will surely be numerous activities lined by the college’s student council or university officers for the entire school year, so pick a few activities that interests you the most (i.e. join sports activities if you are into sports, or join community service activities if you are into social work, etc.). You may also see business manager email signature examples. It will be much easier to join in activities if your classmates will be joining as well, but don’t be afraid if you will be joining an event alone. It builds confidence as well as communication skills. You may also see marketing manager email signature examples. We hope you found this article to be informative as well as helpful when you will be creating your own college email signature. We also provided some examples that you can purchase at very affordable prices. After purchasing the examples (or templates), you can easily edit the templates to fit your own college email signature. You may also see sales email signature examples.